Here is the story that has been told to us in the East Texan way. Robert Musgrave and his wife purchased the 21 acres in the 1990s right outside of Jacksonville, TX. Robert had the idea of making an RV Park while his wife wanted to have a store. Everyone they talked to about developing an RV Park said Robert was just a little bit crazy for thinking that it would do well. Despite the nay sayers, Robert drew up his plans and went ahead and opened “Made in the Shade” in 1999 with 20 RV sites – the first three rows, A, B, C, and D, of the current park. They had overnight guests as well as longterm renters like truck drivers who used the park as their base of operations. Robert and his wife decided to sell, retire and open a convenience store which they still own and run to this day. Frank and Lee Woodard took over the Park around 2003 and decided to expand two rows (the current rows E and F), add a Gazebo, and add an aerobic septic system to service the additional 16 sites. 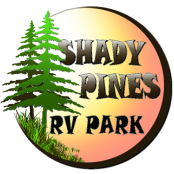 They changed the name to, “Shady Pines RV Park and Campground”. Along with travelers stopping over night, they still had some of the old trucker clientele but they started to get more of the other established working class; road workers, welders, pipe liners, etc. They also ended up acquiring some RV’s that they rented out. They were doing very good business. They had plans for adding a store on the corner of CR 4208 with Hwy 79 frontage. However, they were getting older so they decided to sell and go somewhere with cooler weather. In 2007, along came Jesse Rowley and Georgina Christophersen looking for a good business that we could enjoy running as a team. After visiting several RV Parks for sale in Texas, we decided to purchase Shady Pines RV Park in June 2007. We were eager to put our combined building , landscaping, and management skills to work. We added a bigger Shady Pines RV Park sign and started selling propane. We built three cabins, acquired 18 more RV’s for affordable housing-rentals, added sites to the current rows, added an additional aerobic septic system and put in 14 new RV sites (the current G and H row) bringing the park’s capacity to 62. We landscaped parts of the park adding flowers, more fruit trees, blooming trees, shade trees, and a community garden. We re-graveled most of the roads and the RV sites, and continue to landscape with beautiful flowers. We now strive to add a better quality of life for our Park's community with more activities and community involvement on projects for our RV Parks continued expansion and beautification ! We have added low cost rent to own buildings, with zero down. We would like to have a community center with activities, and we are looking to add anything that would make the Park an even more enjoyable experience! Suggestions are welcome.